We’d love your help. 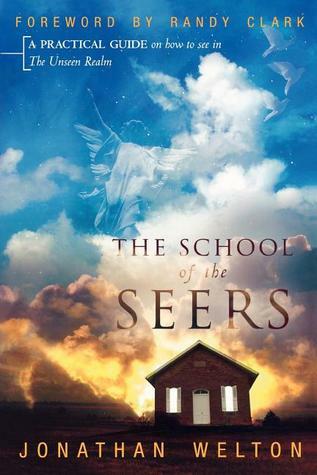 Let us know what’s wrong with this preview of The School of the Seers by Jonathan Welton. Your how-to guide into the spirit realm! Get ready to enter the world of a seer! In this groundbreaking and revolutionary book, Jonathan Welton describes his unique journey about how God opened his spiritual eyes. He shares how you too can activate this gift in your life. See with your spiritual eyes. Use the four keys to greater experiences. Recognize what may be hindering your discernment. Access divine secrets and steward heavenly revelation. Learn how to really worship in Spirit and in Truth. Understand meditation, impartation, and so much more. The fresh and profound concepts taught in this book take a mystical subject--seers and the spirit realm--and make it relevant for your everyday life! To ask other readers questions about The School of the Seers, please sign up. This question contains spoilers… (view spoiler)[can the communication of Godly dreames leade you to na over seer? The dreames and over seer how are they related or they are similer? This was a fascinating read to me. The Holy Spirit uses Jonathan to impart some amazing insight regarding the unseen realm, along with some terrific and practical godly wisdom. This book is worth keeping handy because it's worth going back to, again... and again. This book has helped me understand how God uses me in this way. I have experienced alot of these things on my walk with God and this book has helped train me even more. Such a misunderstood gift that we should embrace. Insightful book with a significant exercise of activation at the end of chapters. Affirms that God is all about signs and wonders. Gives more understanding to the supernatural and spiritual realm. Great book! Great book on the ministry of the seer and the discerning of the spirit. Enlightening and instructional, engaging the reader to take a trip into the supernatural with prayer journaling and mental visualizations. This book was fantastic! I've been meaning to read it since July, so much truth and biblically-sound wisdom to help me press in deeper with my spiritual walk. Just what I needed. I loved everything in this comprehensive book on seers and prophets and seeing in the Kingdom realm. I wish Jonathan would have gone in more detail about his personal experience with the month of seeing in the kingdom realm. I heard him talk about that experience in a podcast once and he went in a little more detail, so I wish there would have been more of that. I enjoyed this book and really gained a lot from it. The only reason I rated it a 4 rather than 5 is that in a couple of places I thought Jonathan made a huge stretch in his interpretation of Scripture in order to make a point. So many amazing nuggets in this book. Will have to go back and study different portions of it. I loved this book and had a hard time not rushing through it. I had to slow myself down so I could really learn and experience every chapter through the activation sections. This book is a practical guide for people who have or want the gift of discernment or what the Bible calls "discerning of Spirits". Everything he teaches in this book he backs up with scripture. He also gives practical exercises to help activate the gift of discernment in you. I highly recommend this book if you feel you ha I loved this book and had a hard time not rushing through it. I had to slow myself down so I could really learn and experience every chapter through the activation sections. I have gleaned so many things from this book and it is one that I plan on referencing and going back to in the future. This was a very worth while read and so needed in the Body of Christ today! This book like no other explains the gift of discerning of spirits in full detail and how to stir that gift inside of us all. So glad I read it! This book was a real blessing and it was definitely encouraging. I have never really been "spooked out" by the spiritual world but coming from a western-rationalize-everything-away culture, it was refreshing to read about the unseen realm. It is definitely not an exhaustive study but covers enough to get a thorough understanding. Highly recommend! Enjoyable to experience such thoughts of others who have been given understanding in this realm as well. Worth the read. I was told to stop reading with three chapters remaining for yet another time. Technically I have not completely the book in its entirety, however, I have read what has been given unto me at this time. This book is phenomenal!!! It was great to have solid biblical application and explanation of the spiritual gifts. I appreciate what Dr. Welton has to say, and it has greatly increased my walk with the Lord. I see and hear from Him like I never have before. This book was a waste of money. He sounded like he was "tooting his own horn" rather than sharing wisdom. His knowledge was shallow and elementary, and inaccurate in many places. Although I believe that his experiences may be true,he fails to educate properly on the topic. Lord has already shown, but good to be stirred up in these things. I recommend it. This booked confirmed a lot of things for me. It was nice to have someone who already is operating in a prophetic realm magnitudes higher than your own to help you along. It wasn't a huge revelation for me, but I did get a lot out of it. This book took so long to read not because it was difficult or boring, it just had exercises in the back and took a lot of thought. That combined with a crazy summer. I thought this was a great book and might read it again soon when I can digest it a bit more. this is a very interesting book, worth reading as it is simple & understandable. It's my follow-up book to "the seers"
Importantly, I've learnt a lot from this 'teaching' book. Brilliant Book! A must read for those with spiritual giftings of Discernment or Prophecy. Love the scriptural references mixed with personal experience. The activations are also helpful as well. This is a practical guide for discerning spirits and prophetic seeing. A fifth generation believer, Jonathan Welton is propelled by a powerful Christian heritage. Exhibiting extraordinary wisdom as a teacher, he helps individuals discover fresh experiences of kingdom realities. Even those who have grown up in the church are challenged afresh as they hear the unique perspective that Jonathan carries. With a duel calling of both teacher and seer, Jonathan raises the st A fifth generation believer, Jonathan Welton is propelled by a powerful Christian heritage. Exhibiting extraordinary wisdom as a teacher, he helps individuals discover fresh experiences of kingdom realities. Even those who have grown up in the church are challenged afresh as they hear the unique perspective that Jonathan carries.